Today, I'm closing my Etsy shop and releasing all the patterns there under a CC-BY license; you can download them here. I'm grateful for the role this blog and shop have played over the last 9 years, especially as a fun and therapeutic hobby. Moreover, the sale of patterns and objects supplemented my stipend, meaning that the financial concerns facing most PhD students and postdocs were less pressing. However, I'm starting a new position soon, prompting a rare desire to clean house, so to speak. Despite the fact that I have one more crochet project in the pipeline, this is obviously an area that's waning in terms of my attention, and it feels like the right time to wind down this operation. At the same time, I'd like to enable people to continue to have access to these patterns and to use them as they see fit. Now that it's too cold (for me!) to bike in Boston, I'm getting back into some crochet during my bus commute. Recently I've been working on making things that resemble proteinaceous capsids (not just viral, mind you, being a microcompartment fan myself). 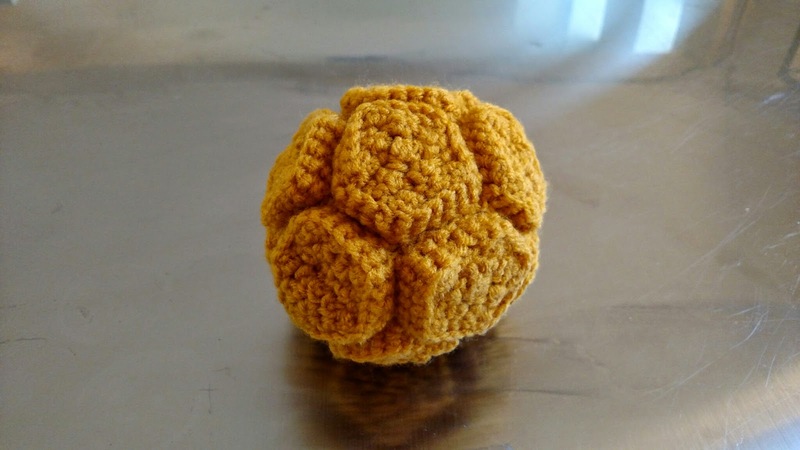 Essentially these are constructed from many smaller crocheted geometric objects. To form the edges of each face, I switch (after a slip stitch) from crocheting in the back loops only to crocheting in the front loops only for one round - and then return to working in the back loops. This leaves a nice, hard edge. More details and patterns to follow! From left to right: crocheting RIGHT handed; crocheting LEFT handed, and crocheting BACKWARDS RIGHT handed. I've been interested in finding ways to represent biological molecules at something representing an accurate scale. To that end, I though it would be awesome to have a standard way of making a double helix of DNA. I tried a bunch of different stitch heights and increase ratios, and it turns out that something very simple works pretty well! 3. In 2nd chain from hook, make two single crochets in top loop. Repeat for each chain stitch. 4. At end, chain 1, slip in same stitch, chain 1. 5. Beginning with the last-worked stitch in the base chain, make two single crochets in bottom loop of the base chain. Repeat for the remainder of the work. This yields a helix with about 10-11 base pairs per turn - there's even a major and minor groove! One problem, though - if you do this RIGHT HANDED, you will end up with a left-handed helix. The double helix is in fact right-handed. (For more on helix chirality, check out figure 1.2 here) See the yellow helix in the picture above. To solve the problem, I've been practicing crocheting LEFT HANDED. This was painfully clumsy at first, but also illuminating. I teach beginners to crochet from time to time, and this has given me fresh insight on how difficult and important tension is. With a bit of practice, I can get a more or less even helix (middle swatch in the photo above). Though I'm improving, it's slow going. Once again Sandy suggested a clever solution to this problem: crocheting right handed, but BACKWARDS. In other words, inserting the hook through the loop of the chain back to front rather than front to back. Here's a tutorial for backwards crochet (note that this appears to be distinct from reverse crochet or crab stitch). One caveat, though - I've been seeing different stitch heights if I don't grab the yarn correctly to pull it through (ie, if I let it wrap around the hook). While barely noticeable on a stitch by stitch level, this has HUGE effects on the helix. Perhaps due to clumsiness or loose tension, the resulting helix (right, in the photo above) is still not as nice as the one I made working left handed, though I could tell I was working a bit faster. Was it worth it? 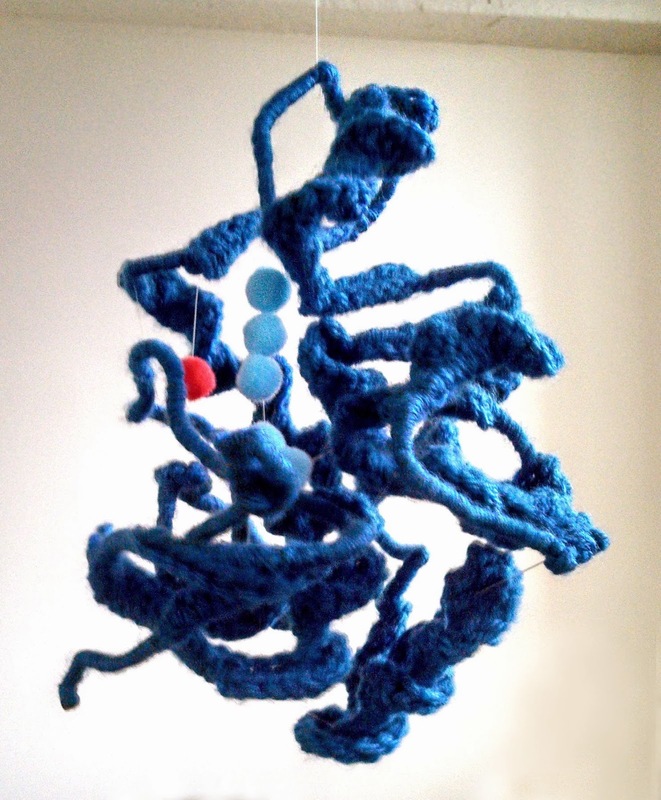 Even though I keep a printout of a beautiful reference guide from the Protein Data Bank above my bench, I guess I never really internalized the relative size DNA and proteins until I tried to crochet them side by side. I was originally hoping to represent each base and amino acid with an individual crochet stitch, but that would require scaling WAY down on the gauge for the protein. Laziness prevailed, and I represented the histones in these nucleosomes not as ribbon diagrams but with a crude surface view of the entire octamer. Along the way, I also came across these beautiful renderings of ribosome tertiary structure that give a sense of the relative scale of protein secondary structure and nucleic acids. Readers may note that this "DNA" has the wrong chirality. I know, I know. I've been kind of wanting to learn to crochet left-handed for a while now so I can more easily teach everyone...but this is definitely making it a higher priority. 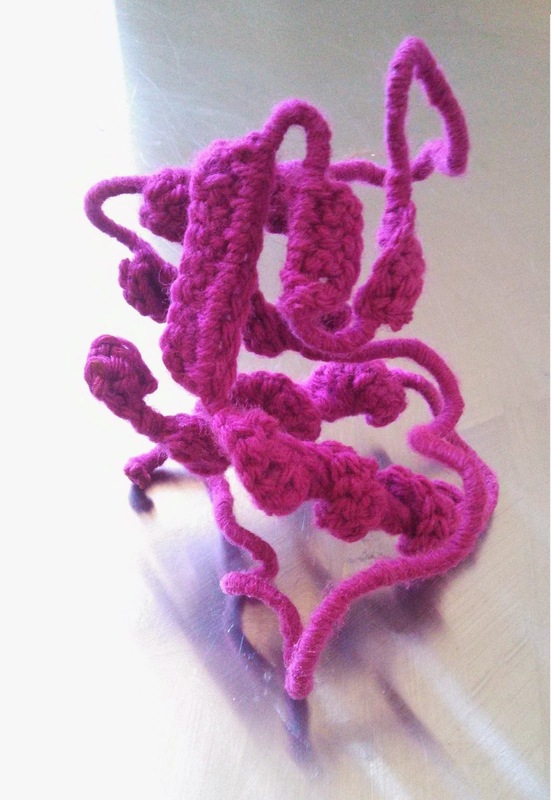 I've been working on a general method for making crochet patterns out of protein crystal structures. For example, here's a ribbon diagram of lysozyme. While the finished 3D structure would be overwhelming to tackle all at once, it's manageable to put together after making the secondary structure first. Patterns for individual proteins as well as instructions for making your own "translations" are forthcoming. Thanks to Sandy for teaching me the technique of working around a wire at the Fiber Arts Work Night at the Artisan's Asylum! 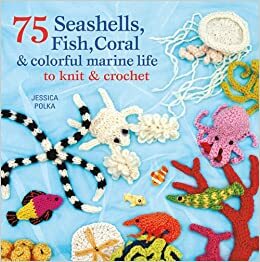 The biggest crochet project I've ever worked on was a book of 75 knit and crochet patterns representing marine life, published a little over a year ago now. Interestingly (and somewhat tragically), the patterns I was most excited about were the ones that had a lukewarm reception at the publishing company. I was hoping they might appear grouped together in a spread called "Under the Microscope," but instead they got cut from the manuscript altogether because they were predicted to draw little interest from the average reader. That's probably true, but I'd like to release them here in the hopes that someone (perhaps on the internet's long tail of bio-nerdiness) can have fun with them! Not only are diatoms awesome in and of themselves, but their complex shapes prompted me to learn some interesting lacework techniques in the quest to approximate them in yarn, which I wrote about here. Also, I had a great time constructing the radiolaria. I think you will too! So, I put together one pdf containing all 11 of these patterns. They're basically in the format I supplied to the publishing company: the patterns are abbreviated, but there is a hand-drawn chart for each one. There's also a legend included on page 2 to help you decipher the text and charts. The whole thing is released under a CC BY-SA license. Enjoy!